A man is accused of driving under the influence after he allegedly drove his vehicle into an embankment in downtown Dover, New Hampshire, colliding with Central Towers. 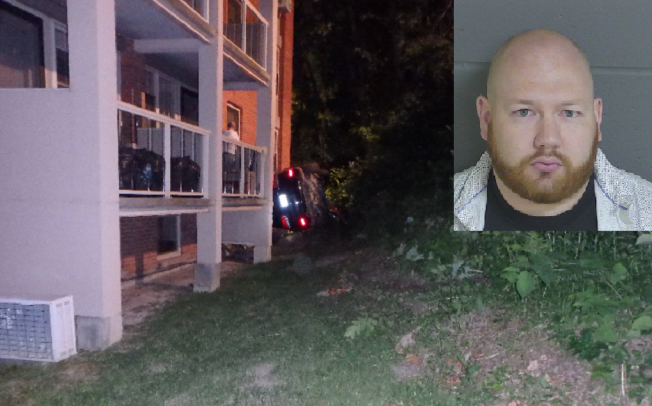 Thirty-year-old Joseph Coughlin was allegedly attempting to perform a U-turn on Central Avenue around 10:30 p.m. on Thursday when he lost control of his 2015 Jeep Grand Cherokee. According to police, Coughlin hit a parked moped before driving over the curb and through a metal fence which guards the embankment next to Central Avenue. The vehicle plummeted down the embankment and collided with the base of Central Towers apartments. Miraculously, Coughlin was unharmed by the collision. The windshield of his vehicle had to be removed for Coughlin to be extricated, and a heavy duty wrecker called to lift the vehicle from the embankment. It's unclear when Coughlin will be arraigned on a driving while intoxicated charge and if he has an attorney.